Merger and acquisition (M&A) transactions commonly incorporate contractual post-closing purchase price adjustment mechanisms. In many instances the post-closing purchase price adjustment process is completed smoothly and collaboratively. In other cases, the post-closing purchase price finalization can lead to disputes between the buyer and the seller that can involve substantial amounts and potentially make or break the deal. Those disputes are often brought before independent accountants for resolution. M&A Disputes allows you to confidently navigate the post-closing purchase price adjustment landscape with firsthand insights from two highly experienced M&A dispute professionals. The combined expertise of the authorial team quickly brings you up to speed on the post-closing adjustment mechanisms and the dispute resolution process with an easy-to-understand framework before engaging in an in-depth discussion of the various facets of M&A disputes. 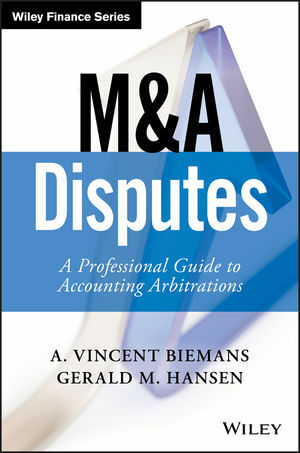 M&A Disputes provides a comprehensive walkthrough of the entire M&A dispute resolution process, from selecting an accounting arbitrator through final award. It also provides helpful tips to pre-emptively mitigate and possibly avoid costly breakdowns during the post-closing purchase price adjustment process. Whether you are working in-house or at a professional services firm, its in-depth coverage serves as a road map for achieving optimal results.